On May 18th, Paul McCartney will release four 2018 edition catalogue reissues via MPL/Capitol: NEW, Chaos And Creation In The Backyard, Wings Greatest and Thrillington. All four titles will be issued in affordable single CD digipak and 180-gram black vinyl single LP formats—and will be made available for the first time in limited edition 180-gram color vinyl pressings. All vinyl LPs will include a download card. Upon its release in 2013, NEW was lauded by Rolling Stone as “energized and full of joyous rock & roll invention.” Executive produced by Giles Martin and also featuring production by Mark Ronson, Ethan Johns and Paul Epworth, NEW entered the U.S. chart at No. 3. The album scored positive reviews from Entertainment Weekly to Pitchfork and all points in between, while the title track, “Queenie Eye” and “Save Us” would become staples of the McCartney live show over the course of the Out There and One On One world tours. NEW’s 2018 edition will feature the first vinyl pressing of the album since its 2013 release, including a limited edition pink vinyl 180-gram vinyl LP with download card and 12×12” insert. Released in 2005, Chaos And Creation In The Backyard was instantly hailed as continuing a hot streak that included “Flaming Pie,” “Run Devil Run” and “Driving Rain.” Produced by Nigel Godrich (Radiohead, Beck) and featuring the singles “Fine Line” and the Grammy-winning “Jenny Wren,” Chaos And Creation… debuted at No. 6 on the Billboard chart. 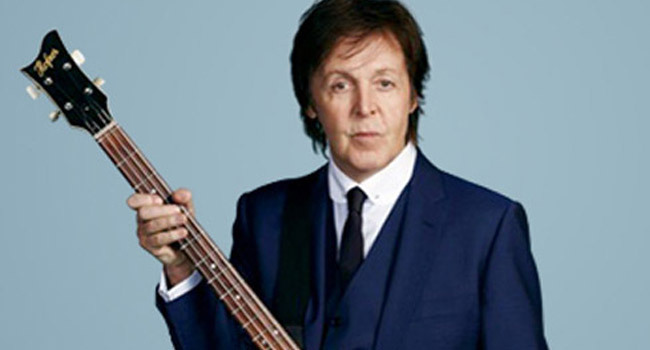 It remained on the charts for nearly half a year, while McCartney mounted the massive US Tour. In 2007, “Jenny Wren” won the Grammy for Best Male Pop Vocal Performance, while the album was nominated in three other categories including Album of the Year. The 2018 edition of Chaos And Creation… will make the album available on vinyl for the first time since its initial run and will include a limited edition gold vinyl 180-gram vinyl LP with download card and 12×12” insert. Originally released in 1978, Wings Greatest was the first ever compilation of Paul McCartney’s post-Beatles hits, featuring four classics that had previously been unavailable on any McCartney album: “Another Day,” “Junior’s Farm,” “Hi, Hi, Hi” and “Mull of Kintyre.” The penultimate Wings album release, Wings Greatest was naturally a worldwide hit, and the soundtrack to the 70s for a generation. As part of its 2018 edition reissue, Wings Greatest will be available as a limited edition blue vinyl 180-gram vinyl LP with download card and 20”x30” poster. Recorded in 1971 but not released until 1977, Thrillington remains one of the most enigmatic entries in the storied McCartney discography. Credited to the pseudonym Percy “Thrills” Thrillington, a fictitious socialite whose activities were chronicled in UK newspaper ads, Thrillington was actually a fully re-imagined instrumental lounge/jazz version of Paul and Linda McCartney’s RAM. With Thrillington’s 2018 edition, Percy is given a new lease on life with this collector’s item available on vinyl for the first time since the 1977 first pressings that fetch hefty sums on the collectors’ market, plus a limited edition red/black marbled 180-gram vinyl LP with download card.